Find out what people want and where to get great ideas to start your business. How to use the Internet as well as traditional sources to conduct your market research. Details of how to go about preparing your plan and the topics you should cover. How to use your plan to obtain financing. You have to decide between debt or equity. Learn about angels or informal investors or how to get bank financing. Take a look at the choices you have for the legal form of your business together with registration for sales taxes. Also, how to protect your trademarks. Learn how to use direct mail marketing, telemarketing and fax broadcasting. What’s involved with the Do-Not-Call lists. Take a look at advertising in magazines, newspapers and on radio or TV. Calculate the effectiveness of Yellow Page advertising, participating in trade shows, fairs and flea markets. Consider door-to-door selling, cold calling and house parties. How to use permission-based e-mail and e-newsletters. Constantly review how you are doing and be prepared to change your strategy. 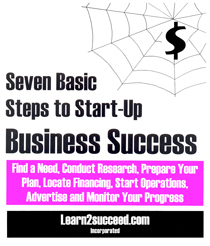 Seven Basic Steps to Start-Up Business Success: Find a Need, Conduct Research, Prepare Your Plan, Locate Financing, Start Operations, Advertise and Monitor Your Progress by: Learn2succeed.com Incorporated: Softcover; 158 pages; ISBN: 978-1-55270-360-1 Published in 2009, $24.95.